(Lowell, MA) Maybe you’ve been wondering what your teenaged Millennial child or grandchild was doing while hanging in a basement with friends, or perhaps you’re a nostalgic Millennial looking to recapture that just-before-graduation feeling. Either way, here is your chance, because “Chill” now playing at the Merrimack Repertory Theatre is the perfect opportunity. The first half of this play takes place in 2001, when four friends gather together just prior to high school graduation. The friends talk, fantasize about their futures, and make each other uncomfortable with awkward teen sexuality. The second half takes place when they come together for a reunion ten years later. 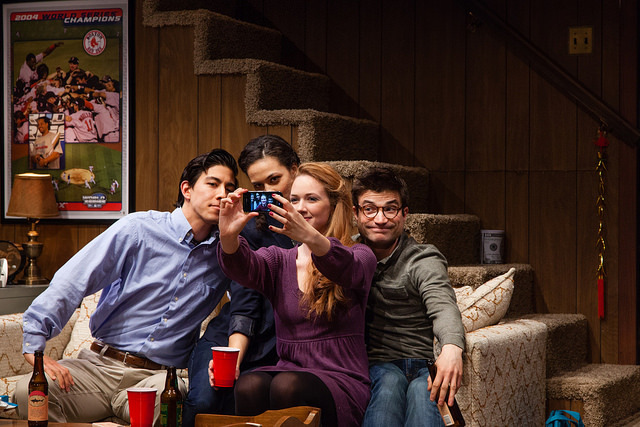 The play explores what it was like to be coming of age in America just after 9/11. The actors themselves deliver strong performances. At the start of the production they seemed to be experiencing some initial anxiety, and some unintended awkwardness ensues, not unlike the awkward sexual tension playing out between the characters they portray. However, the foursome quickly settles into their charters and things begin to feel more real. Their efforts supported by the set, a realistic, homey, Brookline basement created by Scenic Designer, Christina Todesco. The small details throughout the play ring true to this Brookline native. Ultimately, Chill is a character study reminiscent of Dazed and Confused. Writer Eleanor Burgess brings the lives of four ordinary but engaging suburban kids to life. Throughout the first half, the play gathers momentum. I left for the intermission rooting for these kids and all their potential. However, as the second half progressed, I started to wonder what, if anything, the kids have learned? They seemed to be the same, albeit more jaded, older versions of themselves, and their lives seemed to have stalled out. But maybe this is scriptwriter Eleanor Burgess’s larger point, that in the wake of 9/11, so many young people were denied the futures that had been long promised. If that is the case, it is a solid plan to make the audience feel the disappointment that the characters are living. It’s how we felt board watching Harry, Ron, and Hermione wonder about looking for horcruxes to distort in order to rid the world of Voldemort. Your audience is now with the actors, craving forward movement. The trouble is, the audience is craving movement. We need to see Harry and his friends fight for those horcruxes, even if they fail. If J.K. Rowling had ended her series without the gang finding them, I’m willing to bet angry mobs would have stormed her castle. Does Burgess’s gang ever find their horcruxes? I guess you will have to go see the play to find out. And no matter what, you will end up spending an enjoyable evening with friends with in a basement. This entry was posted in Comedy, Uncategorized and tagged 2017, 9/11, April, Brookline, Chill, Christina Todesco, Danny Bryck, Dazed and Confused, Eleanor Burgess, J.K. Rowling, Kate Lew Idlebrook, Kim Fischer, Lowell, MA, March, Maria Jung, Megan Sandburg-Zambian, Meghan Moore, Merrimack Repertory Theatre, Monica Giordano by Kate Lew Idlebrook. Bookmark the permalink.